Tiny House Living with a View of the Pond, Location, Location, Location! Property 10: Tiny House Living with a View of the Pond, Location, Location, Location! The Cottage ~ Walk to Flat Rock Playhouse and local restaurants and shops ~ Swimming Pool access! Property 13: The Cottage ~ Walk to Flat Rock Playhouse and local restaurants and shops ~ Swimming Pool access! Property 19: NEW! 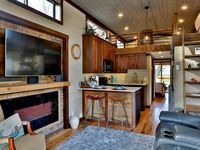 Luxe Flat Rock Home w/ Treehouse & Mtn Views! Cozy cabin with thoughtful, modern amenities in a secluded natural environment. Property 20: Cozy cabin with thoughtful, modern amenities in a secluded natural environment. Property 30: Garden Cottage, 1940's Updated Vacation Cottage, Awesome Carolina Room! Property 31: Time to relax on our porch! Property 33: A Solid Pick For Your Next Stay! Property 34: The BLUE RIDGE CABIN at PINNACLE... Your Perfect Mountain Getaway Awaits! 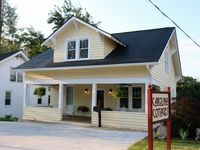 Property 35: One Of The Best Deal's In WNC! Best Value On Historic Main Street! Property 36: Best Value On Historic Main Street! Property 47: Rustic Log Cabin on 25 Acre Mountain Retreat, Relax with Nature, Pond, & Stream! It was perfect. More enjoyable and quieter than a hotel. Secure. Close to whatever we needed. Very fun. Unique and comfortable!